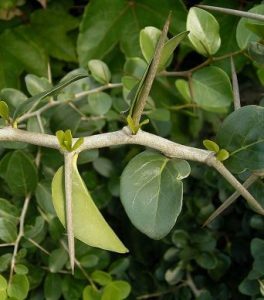 Dovyalis caffra is a shrub or small evergreen tree, usually 3-5 m in height, but sometimes reaching 8 m. Bark grey, smooth on young branchlets but fissured and flaky to corky on old branches and stems. Young branches heavily armed with long (40-70 mm) spines, but stem with few spines. Crown much branched. Root system is not aggressive.